Republicans are debating a new push against what they say are wasteful "green" subsidies in light of news that a recipient of a major stimulus grant for electric vehicle batteries paid workers to watch movies and play games while failing to produce a single battery. According to a report from the Energy Department’s inspector general, lithium ion battery manufacturer LG Chem used money from a $150 million stimulus grant to pay workers to watch movies, play video games, and volunteer at local nonprofit groups. LG Chem cited poor demand for the Chevrolet Volt, the electric car for which the batteries were to be manufactured, as cause for its lackluster grant performance. The company’s Holland, Mich., plant, which received the grant, has not manufactured a single battery that can be used in electric vehicles, according to the IG. President Barack Obama proposed new measures to fund a renewed push for electric vehicles in his Tuesday State of the Union address. He suggested using oil and gas leasing revenue to pay for the project. However, House Republicans are considering an official probe into existing electric vehicle subsidy programs, according to a GOP source, who asked not to be identified since the investigation is not yet underway. Such an investigation would likely make the implementation of another such program difficult. Republicans are already incredulous Obama is proposing new ideas for electric vehicle subsidies, even as existing subsidy programs are plagued by improper federal expenditures. "Only the government could spend $150 million to start a battery company and not come up with a single battery," Rep. Mike Pompeo (R., Kan.) said. Pompeo has introduced legislation to end all energy tax credits. "The president last night during his State of the Union address remained confident he could continue to pick winners and losers," Pompeo said. "No wonder we’re $16 trillion in debt." The IG’s findings substantiated claims by employees of the Holland plant, one of whom told a local news outlet that "there would be up to 40 of us that would just sit in there during the day" rather than actually working. "Through interviews with LG Chem Michigan management and other staff, we confirmed that employees spent time volunteering at local non-profit organizations, playing games and watching movies during regular working hours," the inspector general said in a report released Wednesday. "LG Chem Michigan officials indicated that they had not begun production at the facility because demand for the Chevrolet Volt, the U.S. manufactured vehicle for which the plant was to produce battery cells, had not developed as anticipated," the IG noted. American purchases of plug-in hybrid and electric vehicles over the past two years have only been about a third of the Energy Department’s 2011 projections, according to the Washington Post. LG Chem told the IG it would need an additional $22 million in taxpayer funds to complete the five lines of batteries called for under the stimulus agreement—$13 million more than DOE has set aside for the project. The company said even then it "had no plans to complete the remaining lines unless demand improved dramatically." LG Chem acknowledged the problems at its Holland plant in a statement provided to the Free Beacon. "We regret this situation occurred, and we are confident that we are now taking every measure to be fully compliant in our use of the project grant funding," the company said. LG Chem began conducting "rolling furloughs" last year. The IG report notes that the project has created less than half of the jobs projected by stimulus administrators. 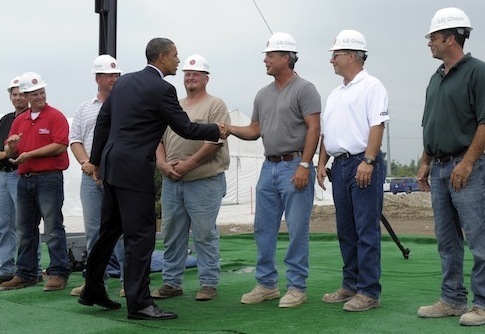 Obama spoke at the groundbreaking ceremony for LG Chem’s Holland plant in 2010. "These plants will put thousands of people to work," Obama claimed. "This includes folks who were working at a couple of facilities being built in Michigan by another battery technology company called A123." This entry was posted in Politics and tagged A123, Barack Obama, Green Energy, Obama Administration, Progressive Movement, Subsidies. Bookmark the permalink.